The bathroom sink is clogged and is slowly draining. It was a little cooler here so the heat was put on in what I would call a very stall and musty suite... Just woke up to a massive since headache an notice right in front of the bed, the ceiling vent has a patch of dust .. vent need cleaning and air purifier in the room.. and lastly the comforter on the bed smell horrible, a sour or mildew odor.. I love the Embassy Suite, but this isn't a good look. The pool and waterslide were a BIG hit with my family. The breakfast not so good. Where to find Winston - Salem hotels near an airport? How can I find hotels in different Winston - Salem neighborhoods? Where can I find hotels in Winston - Salem that are near tourist attractions? From the budget level to the more exclusive, Winston - Salem features a terrific range of comfortable accommodation options. For those wanting to stay within a 0.1-kilometre (0.06-mile) radius of the heart of Winston - Salem, Expedia's comprehensive database contains 34 hotels that meet that criteria. Winston - Salem offers a number of centrally located lodgings, such as the Embassy Suites Hotel Winston-Salem and Winston-Salem Marriott. Winston-Salem, a popular Winston - Salem hotel area with 33 accommodation options is 2 kilometres (1 mile) from downtown. 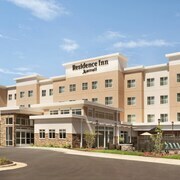 The Residence Inn by Marriott Winston-Salem University Area and Hampton Inn and Suites University Area are amongst the hotel options in Winston-Salem. Other accommodation neighborhoods are Mocksville and Kernersville. The Days Inn Mocksville and Comfort Inn & Suites are in Mocksville, while Kernersville is where you'll find the Holiday Inn Express Kernersville and Sleep Inn. The Quality Inn and Village Inn Event Center are situated in Clemmons, while Hampton Inn Bermuda Run/Advance and Forest Lake RV & Camping Resort are part of the Advance area. 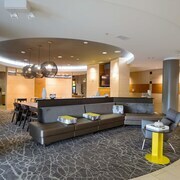 The Courtyard by Marriott Winston-Salem University and Winston-Salem Hotel and Spa are located near the Wake Forest University. 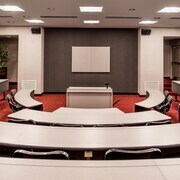 The Courtyard by Marriott Winston-Salem University is 1 kilometre (1 mile) away from the Wake Forest University. The Winston-Salem Hotel and Spa is 1 kilometre (1 mile) away. If you are a budget traveler and are after deals on Winston - Salem hotels or apartments, you'll find that there are also quite a few affordable hotels to consider in the vicinity. The Quality Inn & Suites Hanes Mall is 5 kilometres (3 miles) from downtown, while the La Quinta Inn & Suites Winston - Salem is 7 kilometres (5 miles) away. Different affordable hotels are the Sleep Inn Hanes Mall and the Quality Inn. 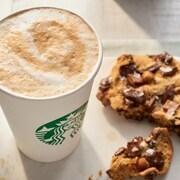 Check out the Courtyard by Marriott High Point or the Hilton Garden Inn Winston-Salem/Hanes Mall. The Courtyard by Marriott High Point is 25 kilometres (15 miles) from the heart of Winston - Salem. 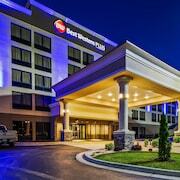 The Hilton Garden Inn Winston-Salem/Hanes Mall, is 7 kilometres (4 miles) away. Some other hotel and apartment options around Winston - Salem are the J.H. Adams Inn and the DoubleTree by Hilton Hotel Winston Salem - University. The greater Western Piedmont area is certainly well worth seeing also. 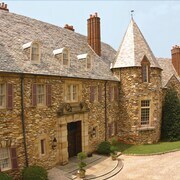 Western Piedmont boasts foothills and tablelands, and common Western Piedmont tourist sights include historic mansions. Popular things to do in this particular part of United States of America include hiking. 40 kilometres (25 miles) to the east of Winston - Salem you will find Downtown Greensboro, where you can spend a few hours exploring Elsewhere and Greensboro Public Library. 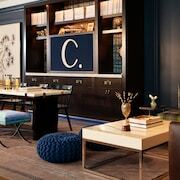 Some of our recommended Downtown Greensboro hotels include the Proximity Hotel and O.Henry Hotel. Alternatively, you could consider staying at High Point, 25 kilometres (17 miles) to the southeast of Winston - Salem, where you can pick from the Hotel NC and Radisson Hotel High Point. The High Point University and Oak Hollow Mall are just some of the more popular attractions to see while in High Point. Piedmont Triad International Airport can be found 30 kilometres (17 miles) from Winston - Salem. Visitors who wish to stay nearby, you can book a room via Expedia at the Homewood Suites by Hilton Greensboro Airport or Embassy Suites Greensboro Airport. What are the most popular Winston - Salem hotels? Are there hotels in other cities near Winston - Salem? What other types of accommodations are available in Winston - Salem? Explore Winston - Salem with Expedia.ca’s Travel Guides to find the best flights, cars, holiday packages and more!